Would you like to give your relatives or friends an unconventional gift but you don´t know what to buy? Or would you like to come up with a nice present for your business partner? Give them one of our gift certificates. You can choose from certificates of four different values. 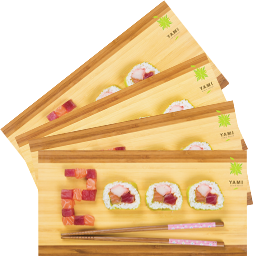 Yami Sushi certificates can be purchased in our restaurant or via the form below. You can pick up your gift certificate in our restaurant (Masná 3, Prague 1). If you have any questions, do not hesitate to contact us on tel. : +420 222 312 756. Gift Certificate expires 6 months from the date of purchase. Yami Sushi house is not responsible for loss, theft, damage or unauthorised use of Gift Certificate. Gift Certificate is valid for onetime use only. Gift Voucher can be used for consumption of food and non-alcoholic beverages only. If the bill is higher than the value of Gift Voucher, the difference has to be paid in cash. Gift Certificate cannot be combined with any other special offer or discount coupon. Gift Certifiacte is not returnable or refundable for cash. Our staff must be able to verify special Gift Certificate code and certificate’s expiration date. If any of these is NOT provided, Yami Sushi reserves the right to decline the voucher and will require payment in full.